Yankee Doodle went to town, riding on a pony. Why? Well, read the book and find out! Just kidding. Apparently, he was bored. His pony suggested a trip to town and the story begins. Why go to town? Well, maybe to buy a feather for his hat. Call it macaroni? Really? Apparently “’macaroni’ is just another word for ‘fancy’”. Hmmmm, isn’t that interesting? This book is full of ‘interesting’ information. This graphic novel was written on a second grade reading level, but older children would enjoy it. There are so many classroom applications for this book that I am not sure where to begin. Writing sequence is an important lesson. Crankee Doodle starts with “first” and moves on to “second” when asking his pony why he would want to call his hat macaroni. Teaching social skills may be as important as teaching reading skills. When Crankee Doodle tells his pony that he smells bad, the pony has a bit of a meltdown. This is an excellent opportunity to teach children about appropriate communication and how our words can hurt. It is also a chance to teach children how to deal with hurtful words. The word choices can make comprehension a little tough for struggling readers sometimes. However, the format makes it interesting enough to keep their attention. 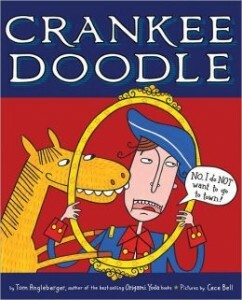 Crankee Doodle is short enough so that most readers would be able to push through, even if a little frustrated. It has just enough complexity in its storyline to keep even advanced readers interested, but not too much to confuse struggling readers. The graphic novel style will appeal to a wide audience, young and old. Author Tom Angleberger is also the author of the Origami Yoda books. All kinds of fun stuff, as well as other books, can be found at his website (http://origamiyoda.wordpress.com/). Illustrator Cece Bell is both an illustrator and author. Her website (http://cecebell.wordpress.com/) has information about her other works, as well as her blog.